John Mooner – who just happens to be a ufologist – has revealed that a series of photos show the moment he was abducted from a street in Torquay, Devon. 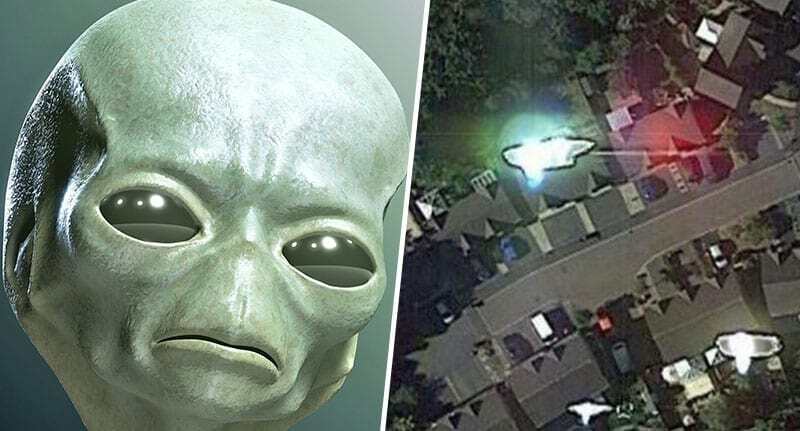 What is more Mr Mooner – who claims he ‘cannot remember the incident’ – says the images also show him fighting off his extraterrestrial foe by punching it in the face, reports the Torquay Herald. Mr Mooner stumbled across the incredible ‘evidence’ of his encounter while following up on another UFO sighting using Google satellite maps. The satellite has captured a real alien abduction taking place. The shocking thing about this was that it’s me being abducted by a grey alien and the satellite image clearly shows me trying to fight off the grey alien by punching it in the face. However, it sounds like his attempts to fight back were in vain as Mr Mooner claims the image shows the alien blocked his punch and grabbed his fist before ‘subduing’ him. The strangest thing about this captured incident is that I do not remember this taking place at all. I do however remember sporadic episodes of missing time throughout the year of 2016 and going back through the previous years. I do remember wearing a black baseball cap and shirt. This is definitely me on the satellite image. He also claims to have further ‘proof’ in the shape of three UFOs he spotted flying in formation which Mr Mooner firmly believes were sent to collect both him and the alien following their encounter.